Cytochrome P450 (P450) enzymes play important roles in the metabolism of endogenous and xenobiotic substrates in humans. CYP2C8 is an important member of the CYP2C subfamily, which metabolizes both endogenous compounds (i.e., arachidonic acids and retinoic acid) and xenobiotics (e.g., paclitaxel). Induction of P450 enzymes by drugs can result in tolerance as well as drug-drug interactions. CYP2C8 is the most strongly inducible member of the CYP2C subfamily in human hepatocytes, but the mechanism of induction by xenobiotics has not been delineated. To determine the mechanisms controlling the regulation of this important P450, we cloned the 5′-flanking region of CYP2C8 and investigated its transcriptional regulation by nuclear factors such as the pregnane X receptor (PXR), constitutive androstane receptor (CAR), glucocorticoid receptor (GR), and hepatic nuclear factor 4 (HNF4α) that are known to be involved in the induction of other P450 enzymes using both cell lines and primary hepatocyte models. We initially identified a distal PXR/CAR-binding site in the CYP2C8 promoter that confers inducibility of CYP2C8 via the PXR agonist/ligand rifampicin and the CAR agonist/ligand CITCO [6-(4-chlorophenyl)imidazo[2,1-b][1,3]thiazole-5-carbaldehyde O-(3,4-dichlorobenzyl)oxime]. A glucocorticoid-responsive element was identified that mediates dexamethasone induction via the GR. We finally identified an HNF4α-binding site within the CYP2C8 basal promoter region that is cis-activated by cotransfected HNF4α. In summary, the present studies show that CAR, PXR, GR, and HNF4α can regulate CYP2C8 expression and identify specific cis-elements within the promoter that control these regulatory pathways. The CYP2C subfamily of cytochrome P450 enzymes is an important class of drug-metabolizing enzymes responsible for the metabolism of approximately 20% of all clinically prescribed therapeutics (Goldstein, 2001). In humans, this subfamily is composed of four members—CYP2C8, CYP2C9, CYP2C18, and CYP2C19—that are localized within a single gene locus on chromosome 10. Significant progress has been made in elucidating the pharmacological and physiological functions of these enzymes in human liver; however, only recently have reports emerged describing the factors that influence their transcriptional regulation (Pascussi et al., 2000; Ferguson et al., 2002; Bort et al., 2004; Chen et al., 2004). Of the four CYP2C isozymes, CYP2C9 and CYP2C8 proteins are expressed at the highest levels in human liver (Goldstein and de Morais, 1994; Inoue et al., 1994), whereas CYP2C9 > CYP2C19 > CYP2C8 are expressed in small intestine (Lapple et al., 2003). CYP2C8 expression has also been reported in kidney, lung, nasal mucosa, and heart (Klose et al., 1999; Ding and Kaminsky, 2003). Our laboratory has recently examined the regulation of CYP2C gene expression by clinically prescribed drugs such as phenobarbital, rifampicin, and dexamethasone (Ferguson et al., 2002; Chen et al., 2003, 2004). We have identified transcription factor-binding sites within the 5′-flanking regions of the CYP2C9 and CYP2C19 genes that are essential for these responses. In this report, we turn our focus to the most strongly inducible member of the human CYP2C subfamily, CYP2C8. CYP2C8 is the principle enzyme that metabolizes a number of clinically prescribed therapeutics, such as the antidiabetic drugs rosiglitazone and repaglinide, the anticancer drug paclitaxel, the cholesterol-lowering drug cerivastatin, and the antimalarials amodiaquine and chloroquine (Totah and Rettie, 2005). CYP2C8 is also known to metabolize endogenous molecules, retinoic acid, and arachidonic acid. Because of the significant expression of CYP2C8 in various extrahepatic tissues, this enzyme may play an important role in endogenous signaling. In fact, CYP2C8 and CYP2C9 have been proposed as endothelial-derived hyperpolarizing factor synthetases and are thought to be located in arteries (Fisslthaler et al., 1999). Therefore, understanding the factors that control CYP2C8 basal expression and induction by drugs is important to understand its biological interactions and better predict adverse drug-drug interactions. The current consensus is that CYP2C8 > CYP2C9 > CYP2C19 is induced by phenobarbital and rifampicin in liver and primary human hepatocytes (Gerbal-Chaloin et al., 2001; Raucy et al., 2002; Madan et al., 2003). These prototypical inducers are also known to strongly induce CYP2B and CYP3A expression and play significant roles in drug-induced drug-drug interactions. Significant progress has been made over the past few years in unraveling the mechanism of these induction processes (Goodwin et al., 1999; Sueyoshi and Negishi, 2001; Wang et al., 2004). At present, it is thought that both the constitutive androstane receptor (NR1I3) and pregnane X receptor (NR1I2) are important for phenobarbital-mediated drug induction in humans (Wei et al., 2002). Rifampicin and other inducers, such as hyperforin (active ingredient in St. John's wort) and paclitaxel, are thought to predominantly activate gene expression by acting as ligands to PXR. Our laboratory, among others, has extended these studies to the CYP2C subfamily. CYP2C9 and CYP2C19 are directly regulated by CAR and PXR (Ferguson et al., 2002; Chen et al., 2003, 2004). The clinically prescribed synthetic glucocorticoid dexamethasone has also been shown to induce CYP2C expression (Gerbal-Chaloin et al., 2001). The glucocorticoid receptor (GR) binds/activates identical GRE half-sites within the 5′-flanking regions of the CYP2C9 and CYP2C19 genes and is essential for dexamethasone induction (Gerbal-Chaloin et al., 2002; Chen et al., 2003). We also have previously identified a site in the 5′-flanking region of the CYP2C9 that binds to the nuclear receptor hepatic nuclear factor 4α (HNF4α) and enhances basal promoter activity (Ibeanu and Goldstein, 1995). Although CYP2C8 is reported to be the most inducible member of the human CYP2C subfamily, there is a paucity of information concerning the transcription factors and binding sites in the CYP2C8 promoter that control these responses. To explore these regulatory mechanisms, we treated primary human hepatocytes with drugs and isolated RNA for RT-PCR, cloned upstream regions into luciferase reporter vectors and transfected them into cells, and performed gel shift assays to identify nuclear receptor-binding sites. Through these studies, we have identified a distal site for PXR and CAR that is essential for the induction of CYP2C8 reporters in primary human hepatocytes, a putative GR-binding site essential for dexamethasone induction, and a HNF4α-binding site that is responsive to HNF4α cotransfection. Rifampicin, dimethyl sulfoxide, dexamethasone, paclitaxel, CITCO, phenytoin, and lithocholic acid were purchased from Sigma-Aldrich (St. Louis, MO). Hyperforin was purchased from Chromadex (Laguna Hills, CA). Cell culture media, fetal bovine serum, and trypsin/EDTA were purchased from Invitrogen (Carlsbad, CA). Oligonucleotides were purchased from Sigma-Genosys (The Woodlands, TX) and desalted. Unless specified, all other reagents were obtained from standard sources. All restriction endonucleases and modifying enzymes were purchased from New England Biolabs (Beverly, MA). Bioinformatics. Regulatory regions of the CYP2C8 gene were obtained via the Celera Discovery System (Applied Biosystems, Foster City, CA) and National Center for Biotechnology Information databases. CAR/PXR-binding sites were identified through customized search motifs and mined using the Discovery Studio GCG (formerly known as GCG Wisconsin Package; Accelrys, San Diego, CA) findpatterns tool as described previously (Ferguson et al., 2002; Chen et al., 2003; Wang et al., 2003; Jackson et al., 2004). The tfsites.dat database within the Wisconsin package, which contains the Transfac database, was used to identify putative transcription factor-binding sites within the proximal CYP2C8 promoter. All DNA-sequencing analyses, vector mapping, and construction and sequence alignments were performed with Vector NTI 9 (InforMax, Bethesda, MD). Isolation of Total RNA and Quantitative RT-PCR Analysis. Total RNA was extracted using RNeasy mini prep system (QIAGEN, Valencia, CA) following the manufacturer's procedure. RT-PCR analysis was performed in two steps by initial reaction with Superscript II (Invitrogen) reverse transcriptase. PCR with SYBR green PCR Master Mix (Applied Biosystems) was then performed with gene-specific primers using standard curves and relative quantitation methods. For the RT reaction, 200 ng of total RNA was combined with 2 μl (40 units) of RNase inhibitor (PerkinElmer Life and Analytical Sciences, Boston, MA), 1× First Strand Buffer (final concentration) (Invitrogen), 10 mM dithiothreitol (final concentration), 0.5 mM dATP, dTTP, dGTP, and dCTP (final concentration), and 1 μl (200 units) of Superscript II to a total volume of 20 μl, incubated at 42°C for 50 min and then inactivated at 70°C for 15 min, and stored at -20°C or immediately used in PCR analysis. PCR was performed on an Applied Biosystems 7900HT using the standard curves method of relative quantitation. In brief, pooled RT reaction products from 3, 0.3, 0.03, and 0.003 μl were run for each target gene and endogenous control gene primer set, and threshold temperatures were determined. Samples were amplified and quantitated via standard curves for each gene. Relative concentrations were normalized for endogenous control gene content, and each sample was calibrated to the vehicle control (DMSO). Using specific primers for CYP2C8 (T570F, 5′-AGATCAGAATTTTCTCACCC-3′; T730R, 5′-AACTTCGTGTAAGAGCAACA-3′), CYP2C9 (65.815F, 5′-AGGAAAAGCACAACCAACCA-3′; 65.903R, 5′-TCTCAGGGTTGTGCTTGTC-3′), and β-actin (actinF, 5′-GAGCTATGAGCTGCCTGACG-3′; actinR, 5′-CACTTGCGGTGCACGATG-3′), PCR reactions were run for 45 cycles at annealing temperatures of 50, 53, and 60°C, respectively. Calculations of the mean ± S.E. are shown in the figures, and the p values are indicated by asterisks calculated via ANOVA and Student's t test. Cloning of CYP2C8 Promoter Sequences and Nuclear Receptors.CYP2C8 5′-flanking regions were cloned by PCR amplification of BAC clone DNA RP11-63F3 (Children's Hospital Oakland Research Institute, Oakland, CA). 2C8-2.5kb was amplified with 2C8-2527F-NheI_F (5′-GCTAGCAATGCTAATACACTCTTGATC-3′) and 2C8-1bpHindIII_R (5′-AAGCTTTGAAGCCTTCTCTTCTTATTAAG-3′), subcloned into pCR2.1 vector, sequenced via Big Dye Terminator Cycle sequencing method (Applied Biosystems), and cloned into pGL3-Basic luciferase reporter vector (Promega, Madison, WI) via NheI and HindIII restriction sites. 2C8-3kb luciferase reporter construct was prepared by amplification of BAC clone DNA with primers 2C8-2966bpMluI_F (5′-ACGCGTAACACTAAAGTGAACTGTGG-3′) and 2C8-2461bp_R (5′-AATCCCAGTTTTCCTGCTTGGTG-3′), subcloning into pCR2.1, sequencing, and final cloning via MluI and an endogenous EcoRI site within the 2C8-2.5kb luciferase reporter described above. 2C9-3kb#1 was constructed and described previously (Chen et al., 2004). 2C8-(-8.9 to -8.5)-TK-Luc was constructed by amplification of a 417-bp region flanking the putative CAR/PXR-binding site located at -8806 bp from the translation start site with 2C8-8888SacI-F (5′-GAGCTCTAGCCATACTAATATCAGAC-3′) and 2C8-8471PacIR (5′-TTAATTAATAGAAACATTGTCTCAGTATGT-3′) primers, subcloning, and subsequent digestion with SacI to insert upstream of the pGL3-TK reporter construct (Promega). This region was subsequently inserted upstream of the 2C8-2.5kb and 2C8-3kb constructs to make 2C8-(-8.9 to -8.5)-2.5kb and 2C8-(-8.9 to -8.5)-3kb, respectively, at the SacI sites of each vector. Construction of 2C8-300bp was analogous to 2C8-2.5kb but using 2C8-301bpNheI_F primer (5′-GCTAGCAGTGTTTCTCCATCATC-3′). Mutation of the putative CAR/PXR-binding site at -8806 was performed via the QuikChange method (Stratagene, La Jolla, CA) using primers Qchange2C8-8806F (5′-GAAGAAACAAATAAGTCAAGGTTGAGGACCCCATTTAATGATAAT-3′) and Qchange2C8-8806R (5′-ATTATCATTAAATGGGGTCCTCAACCTTGACTTATTTGTTTCTTC-3′); bold letters indicate mutated nucleotides. Analogous mutations were performed to make 2C8-(-8.9 to -8.5)-3kbmut8806 that were verified by DNA sequencing. Mutation of the putative CAR/PXR-binding site at -2796 bp was generated with Qchange2C8-2796_F (5′-CAAACAGTAAACCCTATGGACACTTCGAACTTTGGTTG-3′) and Qchange2C8-2796_R (5′-CAACCAAAGTTCGAAGTGTCCATAGGGTTTACTGTTTG-3′) primers to make 2C8-(-8.9 to -8.5)-3kbmut2796 and 2C8-(-8.9 to -8.5)-3kbdoublemut, which was verified by DNA sequencing. Mutation of the putative GRE at -1927 bp of the CYP2C8 promoter was performed via the QuikChange method using primers Qchange2C8-GREmut_F (5′-CAATCTTGGTGGCCCGGTTTCCCTGGATGTTTTGCTTAAAAGG-3′) and Qchange2C8-GREmut_R (5′-CCTTTTAAGCAAAACATCCAGGGAAACCGGGCCACCAAGATTG-3′) to make 2C8-2.5kb-GREmut. 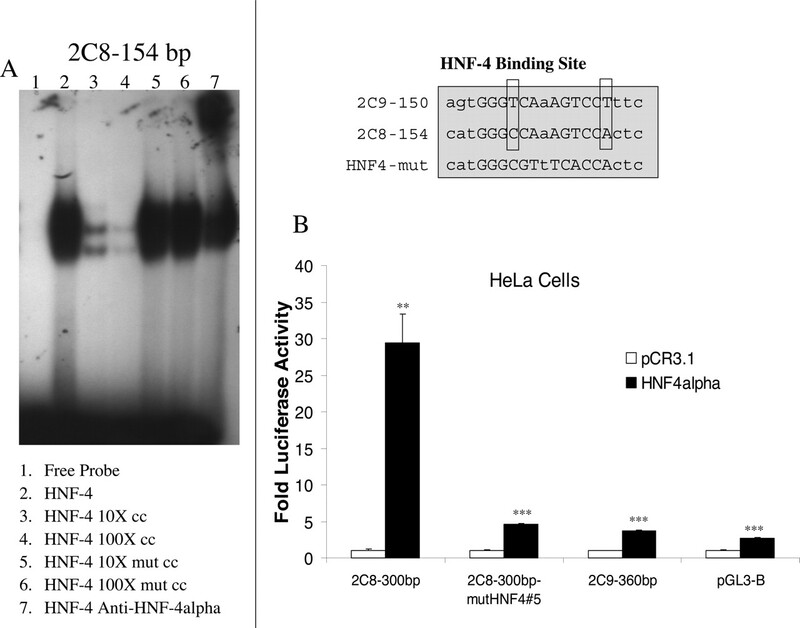 Mutation of the putative HNF4α-binding site at -154 bp was accomplished by amplifying with mutant PCR primers 2C8-mutPCR-HNF4α-NcoI-154bp_F (5′-CCATGGGCGTTTCACCACTCAGAAAAAAAGTAT-3′) and 2C8-1bpHindIII_R and subcloning and cloning this insert to make 2C8-300bpmutHNF4#5 and 2C8-2.5kbmutHNF4α. Mammalian expression vectors pCR3.0-h-CAR, pCR3.1-GR, and pSG5-hPXR(atg) were described previously (Ferguson et al., 2002; Chen et al., 2003). pCR3.0-HNF4α was constructed by amplification of cDNA with gene-specific primers (forward primer, 5′-CTCGTCGACATGGACATGGCCGACTAC-3′; reverse primer, 5′-GGCTTGCTAGATAACTTCCTGCTTGGT-3′) and subcloned into pCR2.1 for sequence verification. This insert was then cloned into pCR3.0 via HindIII and XbaI enzymes, and DNA sequencing confirmed the final mammalian HNF4α expression vector. Cell Culture and Transfections. HepG2 and HeLa cells (obtained from American Type Culture Collection, Manassas, VA) were cultured in Eagle's minimal essential medium with 31 mg/liter penicillin and 50 mg/liter streptomycin and supplemented with 10% fetal bovine serum. Primary human hepatocytes were purchased from CellzDirect (Pittsboro, NC). Primary hepatocytes were maintained in William's E Medium with 31 mg/liter penicillin and 50 mg/liter streptomycin without phenol red and supplemented with ITS (BD Biosciences, San Jose, CA) on collagen-coated plates (Biocoat, Fort Washington, PA). Transfections were performed with Effectene transfection reagent (QIAGEN) using procedures stipulated by the manufacturers, and conditions were optimized for either HepG2/HeLa cells or primary human hepatocytes. All cells for transfection experiments were plated in a 24-well format and transfected for 12 to 18 h, and fresh medium was applied before drug treatments. All transfected plasmids were prepared via QIAGEN Maxi-prep methods, quantitated, and diluted to 100 ng/μl before transfection. Cells were subsequently lysed with 100 μl of passive lysis buffer (Promega) for 0.5 h at room temperature with gentle rocking. Dual Luciferase Assays (Promega) were then performed on cell lysates based on the procedures stipulated by the manufacturer. Gel Mobility Shift Assays. Electrophoretic mobility shift assays were performed as described previously (Ferguson et al., 2002). In brief, human HNF4α, human RXR, human CAR, and human PXR were synthesized in vitro using the TnT Quick Coupled in vitro transcription/translation system (Promega) following the manufacturer's protocol. Probes were labeled with [γ-32P]dCTP purified by Microspin G-25 columns (Amersham Biosciences Inc., Piscataway, NJ). Labeled probe (150,000 cpm) was applied to each binding reaction in 10 mM HEPES, pH 7.6, 0.5 mM dithiothreitol, 15% glycerol, 0.05% Nonidet P-40, 50 mM NaCl, 1 μg of poly(dI-dC), and 1 to 2 μl of in vitro transcribed/translated proteins to a final reaction volume of 10 μl. The reactions were incubated at room temperature for 20 min and then loaded on 5% acrylamide gels in Tris-buffered EDTA, dried, and exposed to film for 6 to 18 h at -70°C. Wild type and mutant nonradioactive competitors were generated by denaturing and annealing unlabeled primers and applied to binding reactions at the indicated concentrations. Antibodies to RXRα and HNF4α were purchased from Santa Cruz Biotechnologies (Santa Cruz, CA). Statistical Analyses. All error bars indicate the mean ± S.E. The p values for each experimental comparison were determined using the ANOVA and Student's t test. For comparison, all of the p values were determined relative to the vehicle or untreated controls. CYP2C8 Induction in Primary Human Hepatocytes. To confirm that CYP2C8 mRNA was induced by drugs in our hands, we first treated primary human hepatocytes with 10 μM rifampicin and 500 μM phenobarbital for 48 h, isolated RNA, and performed quantitative RT-PCR with gene-specific primers (Fig. 1A). We observed an 8-fold induction of CYP2C8 mRNA by rifampicin and a more modest 2-fold activation (p = 0.15) by phenobarbital in hepatocytes from this donor. CYP2C9 was also induced 3-fold by rifampicin (p < 0.001); however, a modest induction by phenobarbital was not statistically significant. In Fig. 1B, an analogous experiment was performed using rifampicin and 10 μM paclitaxel, which is a potent anticancer drug and substrate for CYP2C8 and a ligand for PXR. In this donor, both rifampicin and paclitaxel induced CYP2C8 expression, consistent with previous reports in primary human hepatocytes (Gerbal-Chaloin et al., 2001; Raucy et al., 2002). Figure 1C contains quantitative RT-PCR data from CYP2C8 mRNA in a third set of primary human hepatocytes treated with various inducers for 24 h. Herein, PXR-type ligands such as rifampicin produced a 4-fold induction of CYP2C8 expression. Hyperforin (active component of the antidepressant herbal remedy St. John's wort) has been shown to mediate the induction of CYP3A4 and CYP2C9 via the nuclear receptor PXR (Moore et al., 2000; Chen et al., 2004). 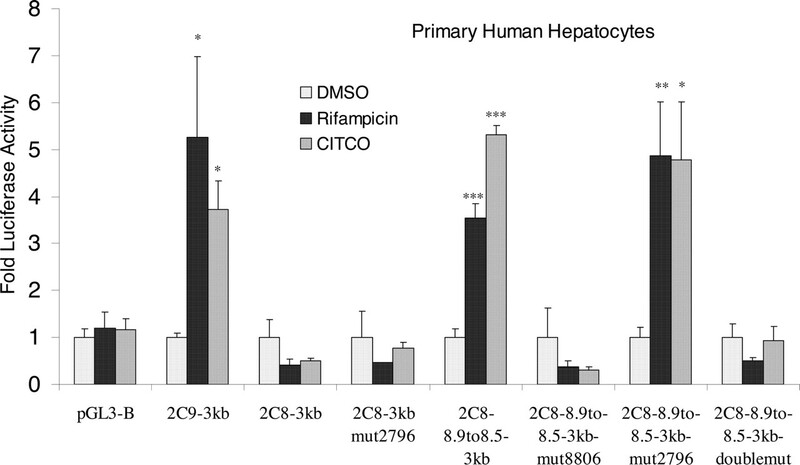 Herein, we show that treatment of primary human hepatocytes with 400 nM hyperforin for 24 h induces CYP2C8 mRNA accumulation 5-fold relative to DMSO-control samples and comparable with the 4.4-fold induction observed with rifampicin. Another reported PXR ligand, lithocholic acid, produced a marginal but statistically significant induction of CYP2C8 mRNA at a concentration of 50 μM. In addition to prototypical PXR ligands, we also examined induction by two reported CAR agonists, phenytoin and, the recently reported human CAR-specific ligand, CITCO (Maglich et al., 2003). Both phenytoin and CITCO induced CYP2C8 expression in hepatocytes from this patient, indicating that CAR may also regulate CYP2C8. Treatment with 10 μM dexamethasone weakly (<2-fold) increased CYP2C8 expression in primary human hepatocytes under the experimental conditions used. From these data, we confirm the reports of others that rifampicin, phenobarbital, and paclitaxel can induce CYP2C8 expression in primary human hepatocytes. In addition, we show for the first time that human CAR-type agonists, phenytoin and CITCO, induce CYP2C8 expression, whereas the herbal ingredient, hyperforin, strongly induces CYP2C8 mRNA accumulation similar to rifampicin. Quantitative RT-PCR of CYP2C8 and CYP2C9 mRNA in primary human hepatocytes. Primary human hepatocytes were cultured in William's E medium and treated with chemicals for 24 h as described under Materials and Methods at the following concentrations: 0.2% DMSO, 10 μM rifampicin, 500 μM phenobarbital, 10 μM paclitaxel, 400 nM CITCO, 50 μM phenytoin, 400 nM hyperforin, 10 μM dexamethasone (Dex), and μM lithocholic acid (Lith. Acid) (50). Quantitative RT-PCR was performed with gene-specific primers on an ABI 7900 instrument. Relative concentrations were calculated using standard curves method. A-C represent human hepatocytes isolated from three different donors. Each treatment group was analyzed in triplicate, and error bars indicate mean ± S.E. for each treatment. *, p < 0.05; **, p < 0.01; and ***, p < 0.001 compared with vehicle (DMSO) control samples. What Factors May Regulate CYP2C8 Expression? To explore the mechanisms of induction, we examined the 5′-flanking region of the CYP2C8 gene. We identified a number of putative transcription factor-binding sites within the CYP2C8 proximal 2000-bp 5′-flanking sequence. CYP2C8 contains several TATA boxes in this segment. Ged and Beaune (1991) identified 2477 bp of 5′-flanking sequence, suggested several putative glucocorticoid receptor-response elements, and reported that the transcription start site for CYP2C8 resides at -23 bp relative to the translation start site. This observation is consistent with initiation at the most proximal TATA box at -56 to -51 bp. However, a CYP2C8 cDNA sequence from human liver deposited in GenBank™ (accession number BC020596) contains 95 bp of the 5′-flanking sequence that is consistent with transcription initiation from the more distal TATA box at -126 to -121 bp (Strausberg et al., 2002). Thus, it is possible that both TATA boxes are functional in liver. We also observed a putative HNF4α-binding site at -154 bp that has previously been observed (Cairns et al., 1996); however, this site has not been characterized to date. Putative sites for HNF5 (-1130 and -1352 bp), HNF6 (-1508 and -1945 bp), and HNF3 (-1042, -1132, and 1341 bp) were also found along with more general transcription factor sites, such as the GATA-binding protein (multiple sites) and two CCAAT enhancer-binding protein sites [-1007 bp, previously noted by Klose et al. (1999), and an additional site at -185 bp]. All of these sites are upstream of the transcription start site and may function as enhancers or in the basal transcription machinery. HNF3 has recently been shown to activate transcription of all of the CYP2C promoters (Bort et al., 2004). It is noteworthy that we observed that a site at -2056 bp in CYP2C8 was homologous to a CAR-RE site identified for CYP2C9 at -1836 bp (Gerbal-Chaloin et al., 2002; Chen et al., 2004). However, the site in CYP2C8 did not match our previously described consensus CAR/PXR-binding site search motif (Ferguson et al., 2002). We also found that CYP2C8 contained a putative glucocorticoid receptor-response element at -1927 bp that is homologous to the GRE identified for CYP2C9. CYP2C8 Induction Mechanism Distinct from CYP2C9 and CYP2C19. Because of the inducibility of CYP2C8 by rifampicin and phenobarbital and the clear evidence for PXR and CAR in the regulation of CYP2C9 via a proximal CAR-RE, we first tested whether the homologous element within the CYP2C8 5′-flanking region may be responsible for the rifampicin induction through PXR. Thus, we examined the ability of CAR/PXR to bind to these homologous elements in gel-shift assays. 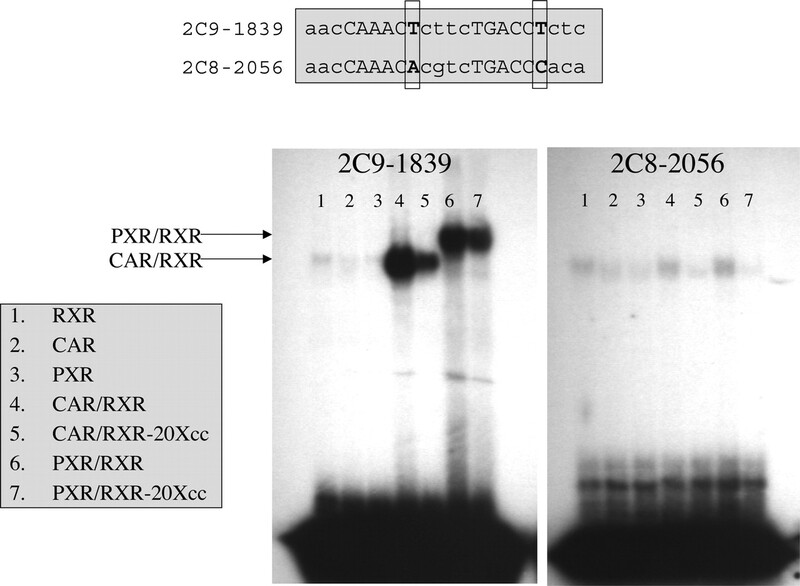 Figure 2 shows that in vitro transcribed/translated CAR and PXR, in the presence of the RXR, binds strongly to the CAR-RE at -1836 bp of the CYP2C9-positive control, whereas the homologous CYP2C8 element at -2056 bp does not significantly bind to either CAR or PXR proteins in the same experiment. These data indicate that this site is not capable of binding CAR/PXR and is probably not responsible for CAR/PXR-mediated drug induction of CYP2C8. Gel-shift assay with 2C9-proximal CAR-RE and homologous 2C8 sequence. Electrophoretic mobility shift assays were performed with oligonucleotide probes labeled with 32P, and binding reactions were performed with in vitro transcribed/translated CAR/RXR or PXR/RXR proteins. Top, comparison of homologous elements from CYP2C8 and CYP2C9 with two mismatches in their half-sites. Left, positive control CYP2C9 sequence known to bind and be activated by CAR and PXR/rifampicin. Right, homologous sequence for CYP2C8, indicating that neither CAR and PXR nor their heterodimers with RXR are able to bind the putative CAR-RE CYP2C8 element at -2056 bp. Competition for binding was done with 20× nonradioactive competitor oligonucleotides to show probe specificity. These data indicate that the element homologous to the principle element responsible for CYP2C9 induction is not capable of efficiently binding CAR or PXR in the CYP2C8 promoter. We further tested whether elements located in the proximal 3 kb of the CYP2C8 5′-flanking region could be activated by CAR or mediate rifampicin induction via PXR in gene reporter assays. Luciferase reporter constructs for CYP2C9 and CYP2C8 were transfected into HepG2 cells and cotransfected with mammalian expression vectors for human CAR or PXR. Figure 3 shows that whereas CYP2C9-3kb reporter constructs were significantly activated by human CAR and induced by rifampicin in the presence of human PXR in HepG2 cells, the CYP2C8-3kb reporter construct was not activated by either receptor. These data are consistent with the lack of CAR/PXR binding to the CYP2C8 element at -2056 bp. Identification of a Putative Far-Upstream CAR/PXR-Binding Site within the CYP2C8 Promoter. Because of the absence of CAR/PXR activation within the proximal 3 kb of the CYP2C8 promoter and the clear induction of CYP2C8 by CAR/PXR agonists, we obtained genomic DNA sequence from the Celera Discovery database and searched for CAR/PXR-binding sites further upstream using the Findpatterns tool in the GCG software suite. In the case of CYP3A4, a DR-3 element at -7733 bp was shown to play a major role in PXR-mediated drug induction. We discovered that CYP2C8 contains a perfect match to our consensus DR-4 CAR/PXR-binding sequence in the far upstream of the CYP2C8 promoter at -8806 bp (Fig. 4). This element is nearly identical to the CYP3A4 element at -7733 bp and similar to the CYP2C9 CAR-RE element at -1839 bp. Moreover, this element bound CAR and PXR in gel-shift assays (Fig. 4). 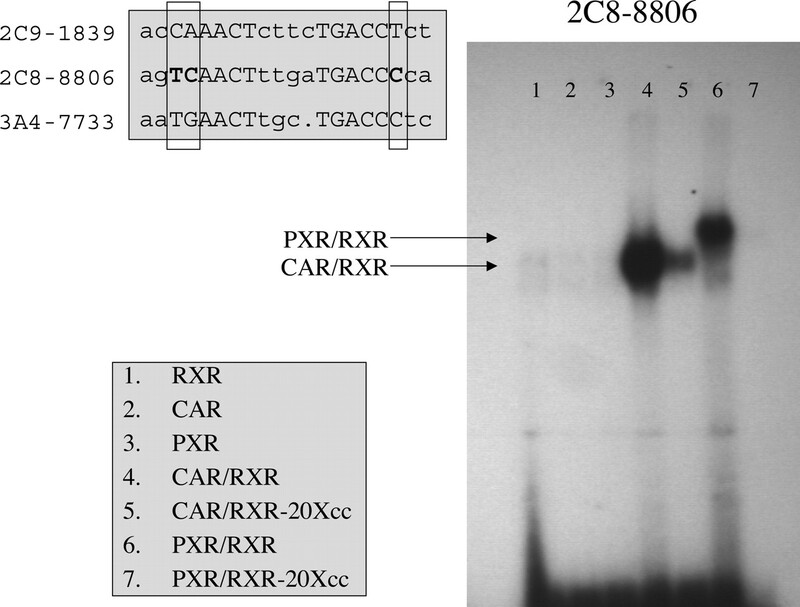 From this representative assay, it is clear that both CAR and PXR in the presence of RXR are able to bind both oligonucleotides from the CYP2C9 element (positive control) and the newly discovered CYP2C8 element located at -8806 bp. These binding interactions were specifically decreased by competition with 20× nonradioactive competitor double-stranded oligonucleotides. CYP2C8 reporter construct is not activated by CAR or PXR/rifampicin (Rif) in HepG2 cells. Luciferase constructs containing the proximal 3000 bp of CYP2C8 and CYP2C9 5′-flanking sequences were cloned upstream of the luciferase gene within the promoterless pGL3-Basic vector. The empty mammalian expression vector (100 ng) (pCR3.1,), pCR3.0-hCAR, or pSG5-hPXR was cotransfected where indicated with 100 ng of luciferase reporter and 10 ng of the pRL-TK internal control plasmid. Error bars indicate mean ± S.E. calculations of three independent samples. *, p < 0.05; **, p < 0.01; ***, p < 0.001 relative to the pCR3.1 empty vector control. In addition to the CAR-binding site at -8806 bp, we also identified a putative DR-5 element at -2796 bp (Fig. 5). This site is homologous with the DR-5 identified in the CYP2C9 promoter but differs by two nucleotides from CYP2C9, making the CYP2C8 sequence a better match to our consensus CAR/PXR-binding sites. Consistent with this observation, CAR/RXR efficiently bound this CYP2C8 element in gel-shift assays, 10× nonradioactive competitor (Fig. 5) decreased the intensity of this complex, whereas 100× nonradioactive competitor essentially eliminated the band (data not shown). Treatments with anti-RXR antibodies demonstrated a clear supershifted band. Although the apparent expression/binding of PXR with RXR to the positive control was much lower in this particular experiment than that of CAR/RXR, PXR/RXR bound equally well to our positive control element and the -2796-bp element, demonstrating that this element can bind both CAR and PXR. However, because of the absence of activation/induction of the 2C8-3kb luciferase reporter as shown in Fig. 3, the possible role of this binding site in CYP2C8 regulation by CAR and PXR remains unclear. 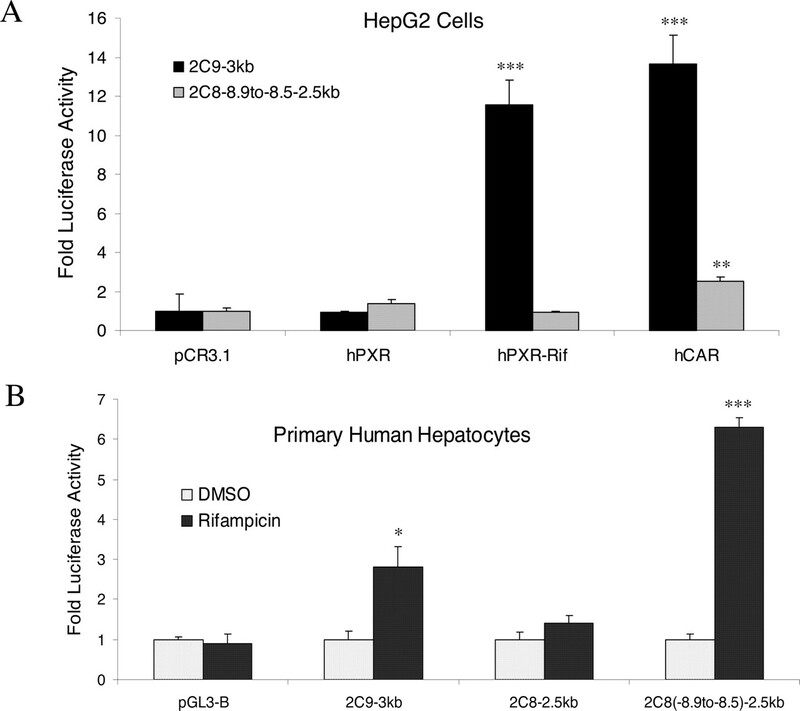 Rifampicin Induction for CYP2C8 Is Observed in Primary Human Hepatocytes But Not HepG2 Cells. Subsequent to the identification of the CAR/PXR-binding site at -8806 and positive gel shift data for both CAR and PXR, we cloned a 400-bp region flanking this sequence and inserted it upstream of the CYP2C8-2.5kb reporter construct. The proximal CYP2C8-2.5kb reporter is not responsive to CAR/PXR in either HepG2 cells (data not shown) or primary human hepatocytes (Fig. 6B). This new construct [2C8-(-8.9 to -8.5)-2.5kb] was transfected into HepG2 cells along with CAR and PXR expression plasmids. We were surprised to observe that although the CYP2C9 control reporters were activated by both CAR and PXR-rifampicin, no rifampicin induction was observed with the 2C8-(-8.9 to -8.5)-2.5kb construct in HepG2 cells (Fig. 6A). A modest 2.5-fold activation was observed with this reporter by the addition of CAR expression plasmids, but this was much lower than that observed for the CYP2C9-positive control. Gel shift assay with 2C8 DR-4 (-8806 bp) CAR/PXR-binding site. Electrophoretic mobility shift assays were performed with oligonucleotide probes labeled with 32P and bound with in vitro transcribed/translated CAR/RXR or PXR/RXR proteins. Top, comparison of validated CAR/PXR-binding sites from CYP2C9, CYP3A4 far upstream, and our newly identified element at -8806 bp with mismatches indicated by boxes. The gel shown below contains our newly identified CYP2C8 element in the far upstream of the CYP2C8 promoter showing strong binding to both CAR/RXR and PXR/RXR heterodimers. Competition for binding was done with 20× nonradioactive competitor oligonucleotides to verify probe specificity. Because CYP2C8 is induced in primary human hepatocytes by phenobarbital, rifampicin, and other CAR/PXR activators, we transfected fresh primary human hepatocytes with this CYP2C8 reporter construct and control reporters in the presence of either 0.2% DMSO vehicle or 10 μM rifampicin (Fig. 6B). These data show that, whereas the CYP2C8-2.5kb construct remains nonresponsive to rifampicin treatment, insertion of the 400-bp distal region within 2C8-(-8.9 to -8.5)-2.5kb confers rifampicin inducibility to the CYP2C8 reporter in primary hepatocytes. These data indicate that HepG2 cells may be insufficient to support CYP2C8 induction via CAR/PXR. However, in primary human hepatocytes, which constitute the best current model system for human liver, we observed both induction of endogenous mRNA by rifampicin and increased transcription with CYP2C8 reporter constructs containing the distal element. Gel shift assay with CYP2C8 proximal DR-5 element at -2796 that does bind CAR and PXR heterodimers with RXRα. Electrophoretic mobility shift assays were performed with oligonucleotide probes labeled with 32P and bound with in vitro transcribed/translated CAR/RXR or PXR/RXR proteins and supershifted with anti-RXRα antibodies. Top, comparison of these homologous elements from CYP2C8, CYP2C9, and CYP2C19 (the homologous element from CYP2C19 does not bind CAR/RXR or PXR/RXR), with boxes indicating sequence differences. This representative gel image shown below contains our positive control CYP2C8 element at -8806 (left) that typically binds both CAR/RXR and PXR/RXR with equal affinity (in this gel, the PXR/RXR binding to this control was significantly weaker than CAR/RXR but clearly observable). 10× Nonradioactive competitor (cc) was applied in this experiment; however, higher concentrations have been used in other experiments that completely abolish this interaction (data not shown). The DR-5 element at -2796 seems to bind both CAR/RXR and to a PXR/RXR but slightly weaker than the positive control. Anti-RXRα antibodies (Santa Cruz Biotechnology) were used to supershift complexes and show that RXRα is present in the shifted complexes for both CAR and PXR heterodimers. Induction within a Heterologous Thymidine Kinase Reporter Shows That the Element at -8806 bp Is Essential for Rifampicin Induction. To further test the inducibility of this distal region of the CYP2C8 promoter, it was cloned upstream of the heterologous thymidine kinase promoter to make 2C8-(-8.9 to -8.5)-TK. We transfected this construct into both HepG2 cells (no response to CAR/PXR analogous to the lack of response observed upstream of the 2C8-2.5kb reporter, data not shown) and primary human hepatocytes (Fig. 7). 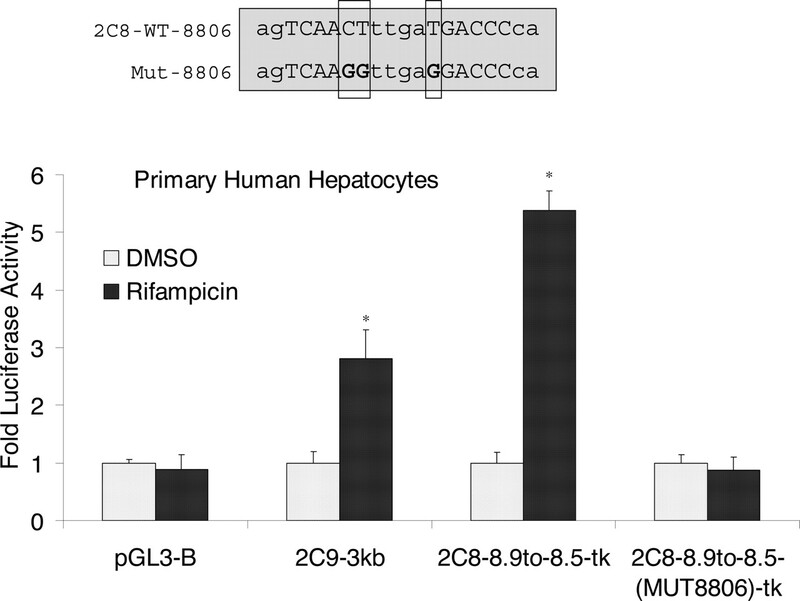 Rifampicin induced transcription of this construct in primary human hepatocytes in a manner similar to the induction seen when the distal region was present upstream of the natural CYP2C8 promoter (Fig. 6B). Furthermore, mutation of the CAR/PXR-binding site at -8806 bp abolished this induction, indicating that this DR-4 element is essential for the rifampicin induction response within this heterologous promoter reporter construct. Primary human hepatocytes support CYP2C8 induction via the far upstream region. The proximal 2500 bp of CYP2C8 and 3000 bp of CYP2C9 5′-flanking sequences were cloned upstream of the luciferase gene within the promoterless pGL3-Basic vector. The far upstream region of CYP2C8 from -8.9 to 8.5kb was inserted upstream of CYP2C8-2.5kb to make 2C8(-8.9 to -8.5)-2.5kb. 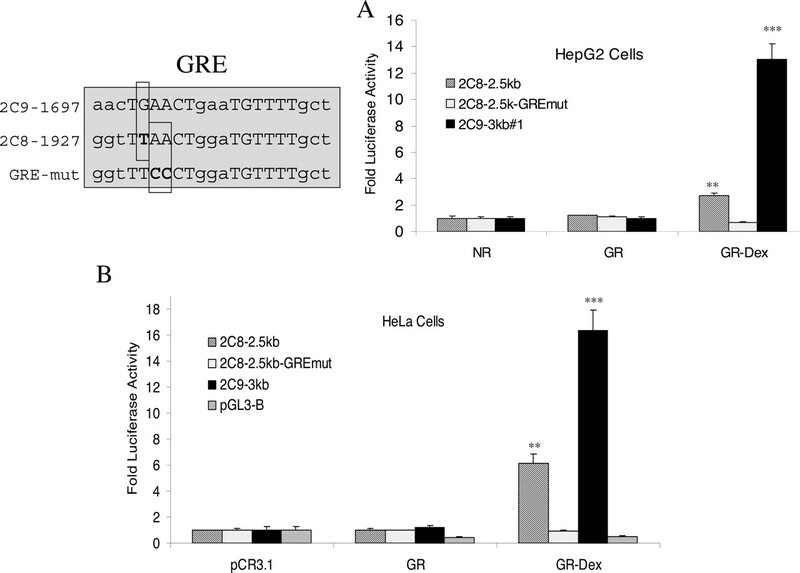 These reporters were transfected into HepG2 (A) or primary human hepatocytes (B). In HepG2 cells, 100 ng of luciferase reporter and hPXR, empty pCR3.1, and hCAR mammalian expression plasmids were cotransfected at 100 ng each with 10 ng of the pRL-TK internal transfection control plasmid. 200 ng of luciferase reporters were transfected into primary human hepatocytes. Rifampicin (Rif) concentrations were 10 μM, whereas all of the samples contained 0.2% DMSO. Error bars indicate mean ± S.E. of a minimum of three independent samples. *, p < 0.05; **, p < 0.01, ***, p < 0.001 relative to the pCR3.1 empty vector control. Both CAR and PXR Agonists Induce CYP2C8 Reporter Constructs in Primary Hepatocytes. To further address the CYP2C8 induction mechanism in primary human hepatocytes, we transfected various CYP2C8 promoter reporter constructs into primary cells and treated them with 0.2% DMSO, 10 μM rifampicin, or 400 nM CITCO (Fig. 8). For the first time, we showed that a human CAR agonist (CITCO) is effective in activating a CYP2C9 reporter constructs (3.7-fold). A 5-fold induction response was seen with the PXR agonist rifampicin. No induction was observed for CYP2C8 reporter constructs containing the proximal -3 kb alone or mutant of a putative CAR/PXR-binding site at -2796 bp. Consistent with previous experiments, 2C8-(-8.9 to -8.5)-3kb was activated by rifampicin (3.5-fold), whereas the hCAR-specific agonist, CITCO, induced CYP2C8 reporter constructs to an even greater extent (5.3-fold). These data demonstrate that both CAR- and PXR-specific agonists regulate CYP2C8 transcription in primary human hepatocytes. Mutation of the CAR/PXR-binding site at -8806 bp [2C8-(-8.9 to -8.5)-3kbmut8806] completely abolished the induction response from both rifampicin and CITCO. Thus, this single element seems to be essential for the PXR-mediated and the CAR-mediated induction of CYP2C8 in primary hepatocytes. Mutation of the putative proximal element at -2796 alone had no effect on rifampicin or CITCO activation of the 2C8-(-8.9 to -8.5)-3kb reporter construct, whereas mutation of both the -8806 distal and -2796 proximal elements (doublemut) abolished the drug induction responses. In total, these data demonstrate that the CAR/PXR-binding site at -8806 bp is required for both rifampicin and CITCO induction and that no additional responsive elements in the proximal -3 kb of the CYP2C8 promoter seem to contribute to the CAR or PXR-mediated induction of CYP2C8. Primary human hepatocytes support CYP2C8 induction via the far upstream region with a heterologous thymidine kinase promoter. Luciferase constructs containing the 400-bp region, including the CAR/PXR-binding site at -8806 bp and mutant construct at the -8806-bp element (mutant generated indicated at the top) upstream of the thymidine kinase promoter, along with control plasmids were transfected into primary human hepatocytes. Two hundred nanograms of each construct with 20 ng of the pRL-TK internal transfection control plasmid were also transfected. Rifampicin concentrations were 10 μM, whereas all of the samples contained 0.2% DMSO for 24 h after transfection. Error bars indicate mean ± S.E. calculations of a minimum of three independent samples. *, p < 0.05 relative to the DMSO vehicle controls. WT, wild type; Mut, mutant. Dexamethasone Induction of CYP2C8 Is Regulated via a Glucocorticoid-Responsive Element. Maurel and co-workers have demonstrated that dexamethasone induced CYP2C8 mRNA accumulation in primary human hepatocytes (Gerbal-Chaloin et al., 2001). In the present study, we identified a putative GRE at -1927 bp in the CYP2C8 promoter that is homologous with the GREs identified in the CYP2C9 (Gerbal-Chaloin et al., 2002) and CYP2C19 (Chen et al., 2003) genes (Fig. 9). In both HepG2 and HeLa cells transfected with GR mammalian expression plasmid, the synthetic glucocorticoid dexamethasone induced CYP2C8 reporter constructs. Mutation of the putative GRE-binding site (GRE-mut) resulted in a complete loss of dexamethasone induction, indicating that this is the essential site for induction of CYP2C8 by glucocorticoids. In total, these data indicate that, unlike CAR and PXR agonists, dexamethasone, a GR-specific ligand, is capable of inducing CYP2C8 gene reporter constructs in HepG2 cells and the response in HeLa cells may suggest that glucocorticoids might also regulate CYP2C8 expression in extrahepatic tissues. The far upstream CAR/PXR-binding site is essential for rifampicin and CITCO induction for CYP2C8 reporter constructs in human hepatocytes. Luciferase constructs containing the proximal 3000 bp of the CYP2C8 promoter or both proximal element and far upstream 400-bp region containing the CAR/PXR-binding site at -8806 bp along with control plasmids were transfected into primary human hepatocytes. Each construct (200 ng) with 20 ng of the pRL-TK internal transfection control plasmid was transfected using the Effectene method (QIAGEN). Drug treatments with 10 μM rifampicin and 400 nM CITCO were performed for 24 h and compared with vehicle (0.2% DMSO) controls. Error bars indicate mean ± S.E. calculations of a minimum of three independent samples. *, p < 0.05; ** p < 0.01; and ***, p < 0.001 relative to respective DMSO vehicle controls. HNF4α Regulation of CYP2C8 via Proximal Binding Site. CYP2Cs have previously been shown to be regulated by HNF4α; however, no studies have been reported on demonstrating its involvement in the regulation of CYP2C8. We cloned the coding region of human HNF4α into a mammalian expression vector to study its role in CYP2C regulation. Figure 10A shows a gel-shift assay with oligonucleotides from a putative HNF4-binding site at -154 bp from the translation start site that is homologous with an HNF4 site identified previously for CYP2C9 (Ibeanu and Goldstein, 1995). These data show that this site is capable of strongly binding to in vitro transcribed/translated HNF4α. This binding interaction is specifically inhibited by wild-type cold competitor but is not inhibited by mutant cold competitor. In addition, anti-HNF4α antibodies were capable of supershifting the HNF4α complex. We next transfected HeLa cells and HepG2 cells with a CYP2C8 luciferase reporter construct in the presence/absence of HNF4α. Although exogenous HNF4α did not seem to activate the CYP2C8 promoter in HepG2 cells, this promoter was strongly activated by HNF4α (29-fold) in HeLa cells (Fig. 10B). HNF4α activation was greatly attenuated (85% decrease) by mutation of the element at -154 bp of the CYP2C8 promoter. Because the empty pGL3-Basic control vector was activated slightly by HNF4α in these assays, the observed 85% attenuation could be adjusted to ∼93% by accounting for this nonspecific activation of the luciferase vector backbone. Thus, the element at -154 bp of the CYP2C8 promoter seems to account for the majority of HNF4α-mediated activation within this 300-bp region. The glucocorticoid receptor mediates dexamethasone (Dex) induction of CYP2C8 via an essential DR-3 element in the proximal promoter region. Luciferase reporter constructs for CYP2C8 containing 2.5 kb of the proximal promoter and CYP2C9 control reporters were transfected into HepG2 (A) and HeLa (B) cells along with our mutant GRE reporter in the presence of GR mammalian expression vectors or empty vector control (pCR3.1). Top left, the GRE sites from CYP2C8 and CYP2C9 along with our mutated CYP2C8 element (GREmut). Luciferase reporters (100 ng) and human GR were transfected along with 10 ng of pRL-TK internal control plasmid. Cells were transfected for 16 h and then treated with either 10 μM dexamethasone or 0.2% DMSO vehicle and incubated for another 36 h before cell lysis. Error bars indicate mean ± S.E. calculations of a minimum of three independent samples. **, p < 0.01; ***, p < 0.001 relative to respective DMSO vehicle controls. In the present study, we have demonstrated functional roles for the nuclear receptors CAR, PXR, GR, and HNF4α in the transcriptional regulation of CYP2C8 expression and identified specific regulatory elements within the 5′-flanking region that are essential for these cell-signaling pathways. A CAR/PXR-binding site was identified at -8806 bp (DR-4) that is essential for the activation of the CYP2C8 promoter by both the PXR ligand rifampicin and the human CAR ligand, CITCO (Maglich et al., 2003), in primary human hepatocytes. In addition, along with rifampicin and CITCO, other CAR/PXR agonists such as phenobarbital, phenytoin, hyperforin, and paclitaxel were also shown to induce CYP2C8 mRNA, further supporting a role for these receptors in the regulation of CYP2C8 expression by drugs. The glucocorticoid receptor was shown to mediate dexamethasone induction of CYP2C8 reporter expression in both HepG2 and HeLa cells, and mutation of a single putative GR-binding site (DR-4) at -1927 bp resulted in a complete loss of dexamethasone induction. Finally, HNF4α was shown to bind to the CYP2C8 promoter at a DR-1 element in the proximal promoter region (-154 bp), and mutation of this element resulted in a marked decrease in the constitutive activation by HNFα of CYP2C8 reporter activity in HeLa cells. Identification of a functional HNF4α-binding site in the basal promoter region of the CYP2C8 promoter. A, gel shift assays were performed on a putative HNF4α/HPF-1 binding site at -154 bp of the CYP2C8 promoter with in vitro transcribed/translated HNF4α. Wild-type and mutant nonradioactive competitors were used to show specificity of probe/protein binding, and anti-HNF4α antibody (Santa Cruz Biotechnology) was used to verify HNF4α presence in the complex. B, sequence comparison of the CYP2C8 and CYP2C9 promoters shows two differences between the HNF4α binding site of CYP2C9 and the putative site identified in CYP2C8. We mutated this element and transfected HeLa cells with 100 ng of luciferase reporter constructs containing 300 bp of CYP2C8 5′-flanking sequence along with control plasmids using 10 ng of the pRL-TK internal control plasmid. Error bars indicate the mean ± S.E. calculations of a minimum of three independent samples. **, p < 0.01; ***, p < 0.001 relative to respective DMSO vehicle controls. Examination of the CYP2C8 basal promoter region revealed several putative binding sites that may be involved in CYP2C8 transcription: TATA-binding protein (TATA) (two sites as previously reported), HNF3, CCAAT enhancer-binding protein, HNF4α, and GATA-binding protein. HNF3, a member of the FOXO family of transcription factors, has recently been shown to regulate CYP2C expression in cell lines (Bort et al., 2004). Thus, many potential nuclear factors may be involved in controlling CYP2C8 transcription in liver and extrahepatic tissues and influence endogenous CYP2C8-mediated cellular metabolism. In the present study, we have shown that CYP2C8 transcription can be regulated by several nuclear receptors and that future studies with some of these other factors may elucidate a more complete understanding of the signal transduction pathways that control CYP2C8 expression. Summary figure comparing known response elements for CAR, PXR, GR, and HNF4α for the CYP2C8 and CYP2C9 genes. This figure summarizes our current view of the regulatory elements within the CYP2C8 and CYP2C9 promoters. The X indicates that although the element is homologous between these genes, this site in CYP2C8 does not bind to CAR/PXR; the boldface question mark indicates that although a second element in CYP2C8 seems to bind CAR/PXR, it is not essential for the induction response to CAR and PXR agonists. All of the other elements shown on the promoter seem to be essential to the efficacy of receptor activation of gene reporters. Preliminary examination revealed that CYP2C8 contains putative sites in the proximal 3-kb promoter that are homologous to those shown to be essential for the regulation of CYP2C9 by CAR and PXR agonists (Fig. 11). We were surprised to observe that, although CAR and PXR agonists induced CYP2C8 mRNA, the proximal 3-kb region of CYP2C8 did not seem to be transcriptionally regulated by drugs in either HepG2 cells transfected with PXR or in primary human hepatocytes. 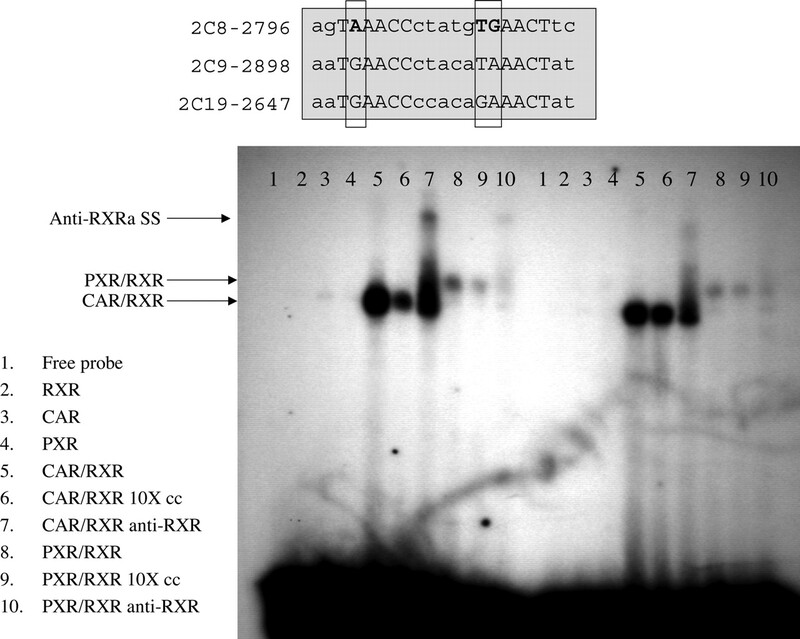 Close inspection of the proximal elements from CYP2C8 and CYP2C9 and gel shift assays of these elements with CAR and PXR proteins revealed that two base differences between the CYP2C9 and CYP2C8 elements prevented CAR/PXR from binding to the proximal element from CYP2C8 at -2056 bp. The location and identity of the more distal half-site within this element seem to be critical for CAR/PXR binding. A more distal DR-5 element at -2796 bp does bind CAR and PXR; however, it does not seem to participate in the transcriptional activation of the CYP2C8 promoter in our experiments. Thus, no CAR/PXR-responsive elements could be identified within the proximal 3000 bp of the CYP2C8 promoter, which is unique for the CYP2C promoters. It is possible that other sites are present between our distal region and the proximal 3 kb of the CYP2C8 promoter; however, our software search techniques failed to identify any strong candidates. Thus, unlike CYP2C9, which is primarily regulated by PXR through a proximal element at -1839 bp, CYP2C8 is regulated instead by a distal responsive element at -8.8 kb. This far upstream region from -8.9 to -8.5 kb was able to confer increased transcription after treatment of primary hepatocytes with both PXR and CAR agonists. This region contains several imperfect AGGTCA half-sites, similar to the far upstream modules found for CYP3A4, MDR1, and OATP2 (Goodwin et al., 1999; Geick et al., 2001; Guo et al., 2002). This type of configuration is not unprecedented in CAR/PXR-inducible genes. The rat OATP2 transporter is induced by the PXR ligand pregnenolone-16α-carbonitrile via an element in the far upstream (∼8.7 kb and a small contribution from an element at -5.5 kb) yet does not seem to contain a proximal CAR/PXR-binding site (Guo et al., 2002). Thus, the mechanism of induction of CYP2C8 by CAR and PXR agonists is unique to this subfamily. In humans, CYP2C8 has also been shown to be the most profoundly induced isoform in response to inducers, such as rifampicin and phenobarbital, and is also induced by the anticancer therapeutic and CYP2C8 substrate paclitaxel and the synthetic glucocorticoid dexamethasone (Synold et al., 2001; Raucy et al., 2002). Our data from primary human hepatocytes confirm these reports with rifampicin, paclitaxel, and phenobarbital and expands the list of inducers to include hyperforin, phenytoin, and the CAR agonist, CITCO (Maglich et al., 2003). These drugs are known to induce transcription of other P450s, such as CYP3A and CYP2B, as well as drug transporters, such as P-glycoprotein, through activation of the nuclear receptors CAR and PXR. This is the first study to show that CYP2C8 and CYP2C9 are inducible by both CAR and PXR agonists. Moreover, the distal element of CYP2C8 confers inducibility with response to both types of agonists. Like other human CYP2Cs, CYP2C8 is also inducible by the synthetic glucocorticoid dexamethasone. Although we observed no dexamethasone induction in our culture system with primary human hepatocytes, this probably was the result of the 100 nM dexamethasone medium supplement used to support maximal induction responsiveness to rifampicin/phenobarbital masking the response. We did, however, observe dexamethasone induction when CYP2C8 reporter constructs were cotransfected with human glucocorticoid receptor expression plasmids. This induction was mediated solely by a single site at -1927 bp, indicating that several other putative GR sites (Ged and Beaune, 1991) are probably not functional. The mechanism of GR induction of CYP2C8 seems to be identical to that observed for CYP2C9 and CYP2C19, and this conservation throughout the subfamily suggests that a selective pressure may maintain glucocorticoid inducibility in humans. In vivo, glucocorticoids are primarily known to decrease inflammatory response and stimulate apoptosis, and knock-out mice have proven that GR is essential for life (Cole et al., 1995). It is interesting that the CYP2C substrate, arachidonic acid, is also known as a proinflammatory endogenous precursor chemical when metabolized by the cyclooxygenase enzymes into prostaglandins (Turini and DuBois, 2002). Thus, it is reasonable to suggest that the glucocorticoid induction of the CYP2Cs may also play a role in inflammation and/or apoptosis through perturbation of arachidonic acid metabolism in certain tissues. It is also noteworthy that the observed GR/dexamethasone induction response of CYP2C8 is also observed within the proximal 2.5 kb of the promoter, indicating that the lack of induction response with CAR/PXR in this region in HepG2 cells is probably not due to a general lack of promoter function or enhancibility within this region. HNF4α was also identified as a regulator of CYP2C8 transcription in these studies. We show that HNF4α activation occurs in the basal promoter region primarily through an element at -154 bp that is homologous with the site identified in the CYP2C9 promoter. Although HNF4α is well known as a hepatic transcription factor, it is also expressed in kidney, intestine, stomach, and skin as well as cell lines from the pancreas in mammals. HNF4α has also been shown to play an important role in the basal expression of many genes, including CYP2C9 (Ibeanu and Goldstein, 1995). In addition to its role in constitutive expression in these tissues, a recent report by Kim and co-workers showed that HNF4α plays an essential role in the drug induction of CYP3A4 (Tirona et al., 2003) and an HNF4α binding site was identified within the far upstream xenobiotic responsive enhancer module (XREM) sequence. One interesting observation in this study was that although HepG2 cells support both induction of CYP2C9 by rifampicin and activation by HNF4α, neither of these responses for CYP2C8 could be elicited in HepG2 cells. 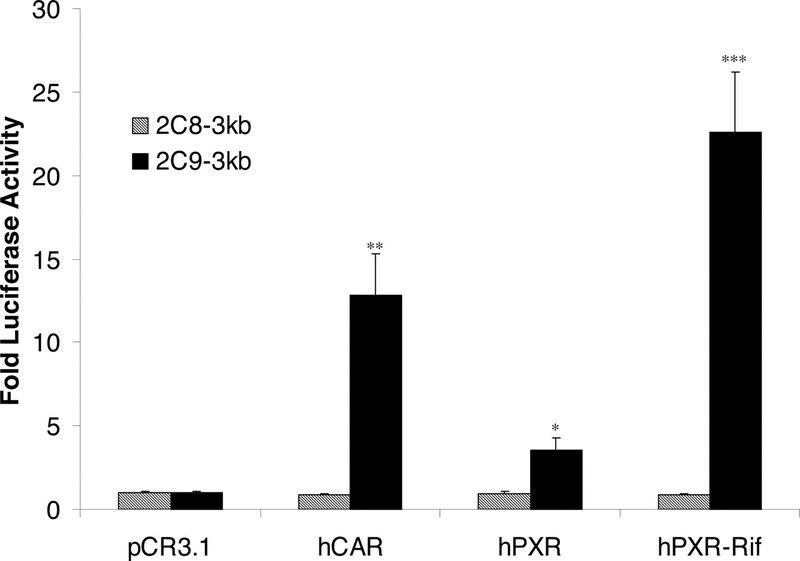 Only primary human hepatocytes were capable of supporting induction by CAR/PXR agonists. This, coupled with the lack of HNF4α activation of the CYP2C8 promoter in HepG2 cells, suggests that factors specifically necessary for CYP2C8-mediated induction may be poorly expressed in the HepG2 cell model. However, we observed a robust activation of CYP2C8 reporters HNF4α in HeLa cells that is comparable with the response with CYP2C9 gene reporters, yet HeLa cells do not support CAR/PXR induction. Thus, the HepG2 cell system is not a good surrogate for studying CAR/PXR or HNF4α activation of CYP2C8. In conclusion, we have identified CAR, PXR, GR, and HNF4α as key regulators of CYP2C8 transcription. Through these studies, we have identified specific elements that are essential for transcriptional activation by these receptors, and unraveling these cellular signaling pathways will help better understand the physiological role of the CYP2Cs and the factors that control their inducibility and contribute to the variability observed in humans. In addition, this is the first clear evidence that CAR agonists as well as PXR agonists transcriptionally activate human CYP2C. We thank Dr. Hongbing Wang (University of North Carolina, Chapel Hill, NC) for his assistance with primary human hepatocytes, and Joyce Blaisdell and Dr. Tatsu Sueyoshi (Laboratory of Reproductive and Developmental Toxicology, National Institute of Environmental Health Sciences, National Institutes of Health, Research Triangle Park, NC) for helpful discussions in the preparation of this manuscript. ABBREVIATIONS: P450, cytochrome P450; h, human; CAR, constitutive androstane receptor; PXR, human pregnane X receptor; GR, glucocorticoid receptor; GRE, glucocorticoid receptor-response element; HNF4α, hepatic nuclear factor 4α; CITCO, 6-(4-chlorophenyl)imidazo[2,1-b]-[1,3]thiazole-5-carbaldehyde O-(3,4-dichlorobenzyl)oxime; RE, response element; DMSO, dimethyl sulfoxide; ANOVA, analysis of variance; TK, thymidine kinase; DR-n, direct repeats spaced by n nucleotides. Bort R, Gomez-Lechon MJ, Castell JV, and Jover R (2004) Role of hepatocyte nuclear factor 3 gamma in the expression of human CYP2C genes. Arch Biochem Biophys 426: 63-72. Cairns W, Smith CA, McLaren AW, and Wolf CR (1996) Characterization of the human cytochrome P4502D6 promoter. A potential role for antagonistic interactions between members of the nuclear receptor family. J Biol Chem 271: 25269-25276. Chen Y, Ferguson SS, Negishi M, and Goldstein JA (2003) Identification of constitutive androstane receptor and glucocorticoid receptor binding sites in the CYP2C19 promoter. Mol Pharmacol 64: 316-324. Chen Y, Ferguson SS, Negishi M, and Goldstein JA (2004) Induction of human CYP2C9 by rifampicin, hyperforin, and phenobarbital is mediated by the pregnane X receptor. J Pharmacol Exp Ther 308: 495-501. Cole TJ, Blendy JA, Monaghan AP, Krieglstein K, Schmid W, Aguzzi A, Fantuzzi G, Hummler E, Unsicker K, and Schutz G (1995) Targeted disruption of the glucocorticoid receptor gene blocks adrenergic chromaffin cell development and severely retards lung maturation. Genes Dev 9: 1608-1621. Ding X and Kaminsky LS (2003) Human extrahepatic cytochromes P450: function in xenobiotic metabolism and tissue-selective chemical toxicity in the respiratory and gastrointestinal tracts. Annu Rev Pharmacol Toxicol 43: 149-173. Ferguson SS, LeCluyse EL, Negishi M, and Goldstein JA (2002) Regulation of human CYP2C9 by the constitutive androstane receptor: discovery of a new distal binding site. Mol Pharmacol 62: 737-746. Fisslthaler B, Popp R, Kiss L, Potente M, Harder DR, Fleming I, and Busse R (1999) Cytochrome P450 2C is an EDHF synthase in coronary arteries. Nature (Lond) 401: 493-497. Ged C and Beaune P (1991) Isolation of the human cytochrome P-450 IIC8 gene: multiple glucocorticoid responsive elements in the 5′ region. Biochim Biophys Acta 1088: 433-435. Geick A, Eichelbaum M, and Burk O (2001) Nuclear receptor response elements mediate induction of intestinal MDR1 by rifampin. J Biol Chem 276: 14581-14587. Gerbal-Chaloin S, Daujat M, Pascussi JM, Pichard-Garcia L, Vilarem MJ, and Maurel P (2002) Transcriptional regulation of CYP2C9 gene. Role of glucocorticoid receptor and constitutive androstane receptor. J Biol Chem 277: 209-217. Gerbal-Chaloin S, Pascussi JM, Pichard-Garcia L, Daujat M, Waechter F, Fabre JM, Carrere N, and Maurel P (2001) Induction of CYP2C genes in human hepatocytes in primary culture. Drug Metab Dispos 29: 242-251. Goldstein JA (2001) Clinical relevance of genetic polymorphisms in the human CYP2C subfamily. Br J Clin Pharmacol 52: 349-355. Goodwin B, Hodgson E, and Liddle C (1999) The orphan human pregnane X receptor mediates the transcriptional activation of CYP3A4 by rifampicin through a distal enhancer module. Mol Pharmacol 56: 1329-1339. Guo GL, Staudinger J, Ogura K, and Klaassen CD (2002) Induction of rat organic anion transporting polypeptide 2 by pregnenolone-16α-carbonitrile is via interaction with pregnane X receptor. Mol Pharmacol 61: 832-839. Ibeanu GC and Goldstein JA (1995) Transcriptional regulation of human CYP2C genes: functional comparison of CYP2C9 and CYP2C18 promoter regions. Biochemistry 34: 8028-8036. Inoue K, Inazawa J, Suzuki Y, Shimada T, Yamazaki H, Guengerich FP, and Abe T (1994) Fluorescence in situ hybridization analysis of chromosomal localization of three human cytochrome P450 2C genes (CYP2C8, 2C9 and 2C10) at 10q24.1. Jpn J Hum Genet 39: 337-343. Jackson JP, Ferguson SS, Moore R, Negishi M, and Goldstein JA (2004) The constitutive active/androstane receptor regulates phenytoin induction of Cyp2c29. Mol Pharmacol 65: 1397-1404. Klose TS, Blaisdell JA, and Goldstein JA (1999) Gene structure of CYP2C8 and extrahepatic distribution of the human CYP2Cs. J Biochem Mol Toxicol 13: 289-295. Lapple F, von Richter O, Fromm MF, Richter T, Thon KP, Wisser H, Griese EU, Eichelbaum M, and Kivisto KT (2003) Differential expression and function of CYP2C isoforms in human intestine and liver. Pharmacogenetics 13: 565-575. Madan A, Graham RA, Carroll KM, Mudra DR, Burton LA, Krueger LA, Downey AD, Czerwinski M, Forster J, Ribadeneira MD, et al. (2003) Effects of prototypical microsomal enzyme inducers on cytochrome P450 expression in cultured human hepatocytes. Drug Metab Dispos 31: 421-431. Maglich JM, Parks DJ, Moore LB, Collins JL, Goodwin B, Billin AN, Stoltz CA, Kliewer SA, Lambert MH, Willson TM, et al. (2003) Identification of a novel human constitutive androstane receptor (CAR) agonist and its use in the identification of CAR target genes. J Biol Chem 278: 17277-17283. Moore LB, Goodwin B, Jones SA, Wisely GB, Serabjit-Singh CJ, Willson TM, Collins JL, and Kliewer SA (2000) St. John's wort induces hepatic drug metabolism through activation of the pregnane X receptor. Proc Natl Acad Sci USA 97: 7500-7502. Pascussi JM, Gerbal-Chaloin S, Pichard-Garcia L, Daujat M, Fabre JM, Maurel P, and Vilarem MJ (2000) Interleukin-6 negatively regulates the expression of pregnane X receptor and constitutively activated receptor in primary human hepatocytes. Biochem Biophys Res Commun 274: 707-713. Raucy JL, Mueller L, Duan K, Allen SW, Strom S, and Lasker JM (2002) Expression and induction of CYP2C P450 enzymes in primary cultures of human hepatocytes. J Pharmacol Exp Ther 302: 475-482. Strausberg RL, Feingold EA, Grouse LH, Derge JG, Klausner RD, Collins FS, Wagner L, Shenmen CM, Schuler GD, Altschul SF, et al. (2002) Generation and initial analysis of more than 15,000 full-length human and mouse cDNA sequences. Proc Natl Acad Sci USA 99: 16899-16903. Sueyoshi T and Negishi M (2001) Phenobarbital response elements of cytochrome P450 genes and nuclear receptors. Annu Rev Pharmacol Toxicol 41: 123-143. Synold TW, Dussault I, and Forman BM (2001) The orphan nuclear receptor SXR coordinately regulates drug metabolism and efflux. Nat Med 7: 584-590. Tirona RG, Lee W, Leake BF, Lan LB, Cline CB, Lamba V, Parviz F, Duncan SA, Inoue Y, Gonzalez FJ, et al. (2003) The orphan nuclear receptor HNF4alpha determines PXR- and CAR-mediated xenobiotic induction of CYP3A4. Nat Med 9: 220-224. Totah RA and Rettie AE (2005) Cytochrome P450 2C8: substrates, inhibitors, pharmacogenetics and clinical relevance. Clin Pharmacol Ther 77: 341-352. Turini ME and DuBois RN (2002) Cyclooxygenase-2: a therapeutic target. Annu Rev Med 53: 35-57. Wang H, Faucette S, Moore R, Sueyoshi T, Negishi M, and LeCluyse E (2004) Human constitutive androstane receptor mediates induction of CYP2B6 gene expression by phenytoin. J Biol Chem 279: 29295-29301. Wang H, Faucette S, Sueyoshi T, Moore R, Ferguson S, Negishi M, and LeCluyse EL (2003) A novel distal enhancer module regulated by pregnane X receptor/constitutive androstane receptor is essential for the maximal induction of CYP2B6 gene expression. J Biol Chem 278: 14146-14152. Wei P, Zhang J, Dowhan DH, Han Y, and Moore DD (2002) Specific and overlapping functions of the nuclear hormone receptors CAR and PXR in xenobiotic response. Pharmacogenomics J 2: 117-126.